We can never purport to completely understand another’s circumstances, his reasons, what drives him, his dreams… not unless we have walked some of his path with him, stood on the island he is on, sat in the boat he is sitting in… and often times, not even then. We can only make allowances for differences in perspective, in priorities, in views. They don’t have to match our own – they add more to us in their very difference. 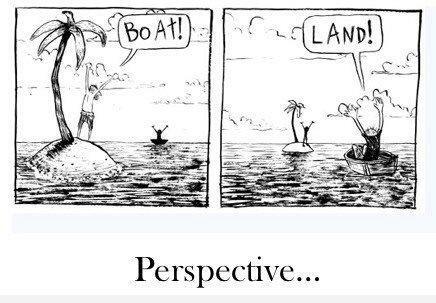 We like the people who make room for our perspective, those who are able to accept and respect it. And then there are those who understand our perspective, maybe even find a match with their own in some of it – the “me too!” moment… yes, our friends. The truly blessed though – the wise – are those who are able to accept, learn from and assimilate many differing perspectives; and paint a common picture. They are able to craft a path that fits each of these perspectives – suits each, preserves the unique beauty of each perspective – and yet brings them together. They become the guides, the mentors… the leaders of men. our choices, our experiences, all that our life holds. This entry was posted in Uncategorized and tagged guides, leaders, perspectives. Bookmark the permalink.